Peter Purvis has been a professional bagpiper for the last decade. He has an accomplished solo career, winning several championship supreme titles in North America as well as gold medals in both light music and Piobaireachd at the North American championships. 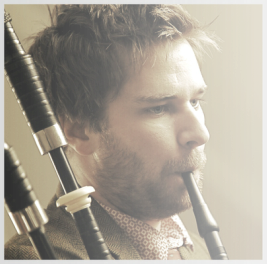 He is a member of international-touring band, Gaelic Storm as well as a member new Greater Midwest Pipe Band. Also, Peter is a sought after teacher for bagpipes and whistles all over North America. He has been a part of the band Gaelic Storm since 2004. He has recorded 2 DVDs and 8 Albums with the band, six of which were #1 in World music on the Billboard charts. Gaelic Storm has earned a reputation as one of the world-music scene’s preeminent Celtic bands. The group’s ability to deftly incorporate a rock sensibility into their sound affords them rare crossover appeal. In recent years, they’ve performed on the same bill with acts ranging from Zac Brown Band and the Goo Goo Dolls to Emmylou Harris and Lyle Lovett, at events as varied as the Telluride Bluegrass Festival and Milwaukee’s Summer Fest. Peter grew up in the small village of Merrickville, located in the Ottawa Valley, Canada. An area famous for its fiddle players, step dancing and maple syrup. He began playing the Highland pipes at the age of 12 and began playing the Uilleann pipes and Irish whistle at the age of 16. Growing up, he had great opportunities to play with some of Canada's finest pipe bands and receive lessons from some of the best known pipers in the world. It was these lessons from elite pipers at a very young age that helped to mold him into the player and teacher he is today.